My Saffron Bun Fish & Coast Week! After another great trip to Cornwall we are back home in Oxfordshire with a heap of images to show you in future blog entries. We have travelled many miles, met several lovely people, tried some great local produce and now have to tell you all about it. As we mainly stayed on the coast for our holiday (difficult not to when in Cornwall) we though we would focus on the coast and fish(ing) and after the Oyster Festival in Cornwall we are going to celebrate the sea and all its glories with our own SaffronBun Fish and Coast Festival! So to wet your appetites dip your toe in here…. 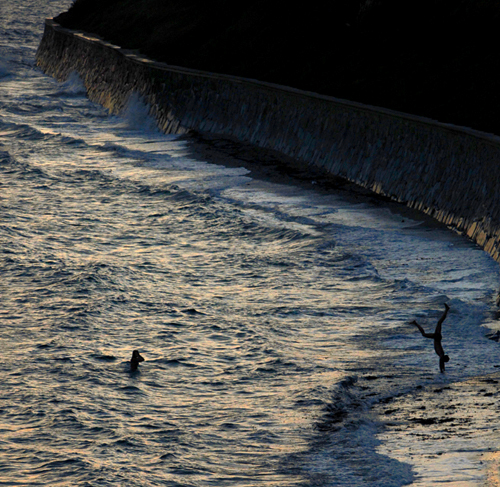 The sun was setting when we drove around Pendennis Point and I saw the waves crashing against the sea wall. I though it would make a great shot for the blog. On getting out of the car and reaching for my camera I couldn’t believe there were two people swimming in the sea in mid October. The guy then came out of the water and proceeded to impress his girlfriend with a few hand stands! Planning to get out this weekend in this fabulous weather? Want to get away from the crowds and maybe dip your toes in the water? Mark is a fabulous guide to his home county and since being together I have been taken all across the countryside to places I never knew existed. Often with Mark’s Mum & Dad with Noel (Mark’s Dad) being navigator – Mark’s good but no one knows the back lanes of Cornwall like his Dad. One time we paid a surprise weekend visit; calling Mum & Dad half way down the M5 to let them know we were on our way! We had one of those idyllic Cornish weekends where the sun shines and the cider flows. We headed to St Just – first make sure you have the right St Just! This is the one north of Lands End not St Just in Roseland ( also a beautiful place…we’ll come back to it another time) In the middle of St Just is a square with a sign to Cape Cornwall. 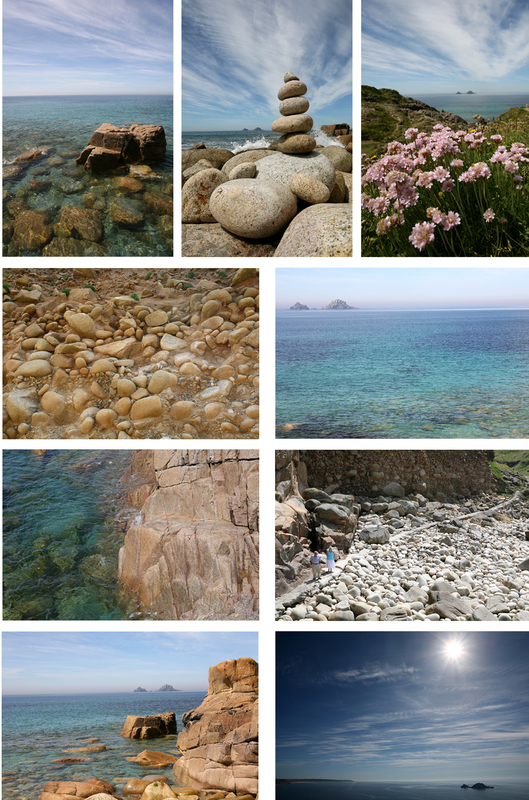 Cape Cornwall is a tiny place. Worth a walk around and to the top where you will find a monument donated to National Trust by Mr Heinz to commemorate 100 years of producing baked beans! Anyway back to Cot Valley; 50 yards down the road from St Just to Cape Cornwall take a left and immediate right onto the narrow road signed Cot Valley. This road passes St.Just Primary School and there are speed bumps in the road! Continue on this road to Bosorne and take left branch to Cot Valley. But the real highlight is Cot Valley. Unlike any other beach or cove in Cornwall that I know of. I couldn’t believe my eyes when we walked along from the car park and I caught sight of the beach. Here’s a few fabulous photo’s taken by Mark to whet your appetite! The photo 2nd up on the right hand side features two very small figures – Noel & Pauline (Mark’s Mum and Dad) this really shows the scale of the boulders…Noel & Pauline are average size in real life! The photo bottom right shows a famous landmark actually called The Brisons but more popularly known as General De Gaulle in the bath. Take a closer look and I think you’ll see why!